The internet has done a lot to level the playing field between buyers and sellers. There’s a new generation of “smart customers” who – with a few clicks – can compare competitive products, their features, prices, availability and delivery options, product reviews, etc. By 2020, that 100 million consumers will shop virtually which explains why more and more business have transitioned into e-businesses to attract customers, sustain competition and grow. Many traditional business and established brands are moving from conservative shop-centric or geography-focused businesses to a more customer-centric and borderless e-commerce (online) business. Being omni-channel is the latest sales approach that uses multiple sales channels while giving the customer a seamless shopping experience. When different channels get integrated at the back end, a customer can check a company’s website for availability of a selected product using his desktop and later purchase the product with a smartphone, tablet or by visiting the store. Exceeding customer expectation is the new ‘normal’ in the current day competitive market. And, omni-channel evidences enhanced customer experience. Although omni-channel has the potential to help businesses exceed customer expectations, there’s a flip side to the story. Apart from the obvious challenge of adverse financial impact, there are several operational challenges associated with managing returns. Major ones are arranging collection of returned goods, allocation of storage space in warehouses, disposal of the returned item for a refurbishment or ‘as is’ sale (as appropriate). Not to mention the time and manpower associated with such tasks. One of the biggest challenges of omni-channel is returns management and planning for reverse logistics. According to Invesp inforgraphic on online return rates statistics, at least 30% of all products ordered online are returned. Clearly, businesses need to work around the return challenge in-order to profit. A survey by Deloitte revealed that while 81% of customers want clear instructions on return policies, only 41% of online retailers met this requirement. Fulfilling this need represents a clear the path to a marketable, competitive advantage for online businesses – but it does come with a price tag. Accessing the financial impact due to returns : Overlooking the returns and reverse logistics cost could be very expensive to a business. Returns involve transportation, handling and warehouse costs. It is a good practice to allow room for ‘returns’ while forecasting costs. 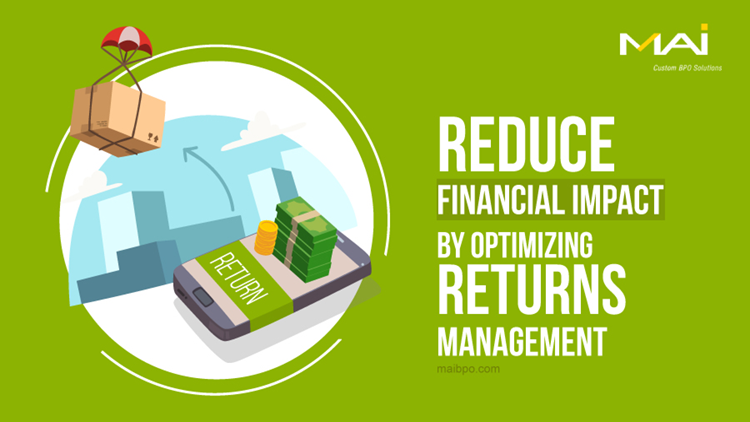 Develop operational strategy to manage returns : An effective returns management requires a clear operational strategy. Businesses should develop policies that count in the financial impact associated with returns management. Shipment and return statistics should be tracked and analyzed periodically against industry standards. This helps understands if you are following the best industry practice. It also helps in optimizing financial impact. For example, integrating the delivery and return channels to reduce cost on reverse logistics. Recovering cost : In order to recover return costs some businesses charge a fee for return shipment. A clear return policy could be accompanied with a tiny cost. Example – a return policy charge could be added to the product’s price. This cost helps to recover at least a portion of the losses incurred due to returns. Collect and dispose returns : Businesses need to determine an effective and profitable way to dispose returned goods. They may be sold ‘as is’, refurbished, re-manufactured or in some cases sent directly sent to a clearance reseller. The pros and cons of various practices need to be weighed before choosing the apt solution for re-sale. Some companies do the picking of returned goods by themselves. Others hire a 3rd party logistics partner to do it for them. However, in this case there is no control over the process. It is very important to appoint a reliable 3PL Partner. With e-commerce giants like Amazon who have set high customer service standards, newer and smaller businesses have an all-the-more acute competition to deal with. Hence, it is vital that businesses plan and manage returns appropriately to sustain and grow. To know more about MAI's expertise in contact center and fulfillment services, please drop in an email now! "The Bridgestone Firestone purchase resale program was initiated in 2000. The main objective of the program was to provide automotive dealerships, muffler and brake shops and general service stations with the support tools they needed to sell Bridgestone Firestone tires to end users." "We rely on MAI, an established provider of call center and fulfillment services, to deliver efficient service and unparalleled customer satisfaction. MAI has proven to be an excellent outsourced solution and a true business partner. The company’s background in marketing communications and brand support ensures we are being represented at the highest level possible." "MAI recently completed its fifth season as Figi’s outsourced call center partner. We have gained incremental efficiencies year-over-year with regard to the program ramp up – not only from a human resources perspective, but from a technology and telephony standpoint as well." "MAI developed, produced and monitored a direct mail initiative on behalf of ColeTaylorBank which has served the needs of Chicago area business for more than seven decades. The program achieved a 1% response rate and resulted in a sizable new account win, as well as valuable exposure to a group of highly targeted prospects." "MAI had the I-PASS customer service/transponder fulfillment program up and running in half the time originally projected for start up. Within 90 days, call volumes increased 250% in response to a planned increase in tolls for customers without I-PASS transponders. Because MAI built the program for scalability, the increased demands were quickly taken in stride." "The information collected was invaluable in developing an advertising campaign that exposed the realities of the issues surrounding the‘health services’ provided by Planned Parenthood. I had the opportunityto monitor the survey calls on several occasions and was impressed with the Marketing Alternatives staff members assigned to our project. The interviewers were polite, respectful and very professional." "MAI has always provided good reporting and it just keeps getting better. My team loves it. The best part is, they realize the relevance and value of the information that is now available and it’s being used to strengthen and improve our business." - Nancy Barbee, Assistant Marketing Manager, Domino Foods, Inc.
"Firestone Complete Auto Care customers enjoy the convenience of scheduling service appointments online thanks to MAI’s creative thinking and outstanding IT capabilities. Not only do customers enjoy a higher level of service, we are now able to identify – and resolve – store issues that have resulted in lost opportunities in the past." "Shipping product to customers quickly and accurately is a vital part of our business. MAI takes great care of all of our shipping needs, so I can focus on everything else that needs to be done. When we have a shipment with special requirements, we always know MAI will handle it without a problem." - Christy Kaskey, Owner, Kaskey Kids, Inc.
"MAI conceived, designed and produced the Mohawk Tile Bottega within-a-store program. From creative through warehousing, fulfillment and installation, MAI acted as a single-source partner to make this concept materialize into reality." "MAI’s flexibility was a contributing factor to Mustela’s success in growing its business in the U.S. and Canada. Their active and forward thinking saved time and money while fostering great relationships with our retail customers." "Excellence is the standard at Standard Coffee and we expected no less from our partnership with MAI. We’ve heard only positive feedback about them from the Standard Direct customer base – they truly handle our business as if it was their own." "The lead qualification program MAI put together for Wilsonart Flooring helped our sales team enormously with time management. By prioritizing the leads, salespeople could focus on the strongest opportunities which, in turn, helped close more sales." If you would like to receive periodic news from MAI, please click here to subscribe to be added to our email distribution list. Copyright © 2015 mktalt.com. All rights reserved.